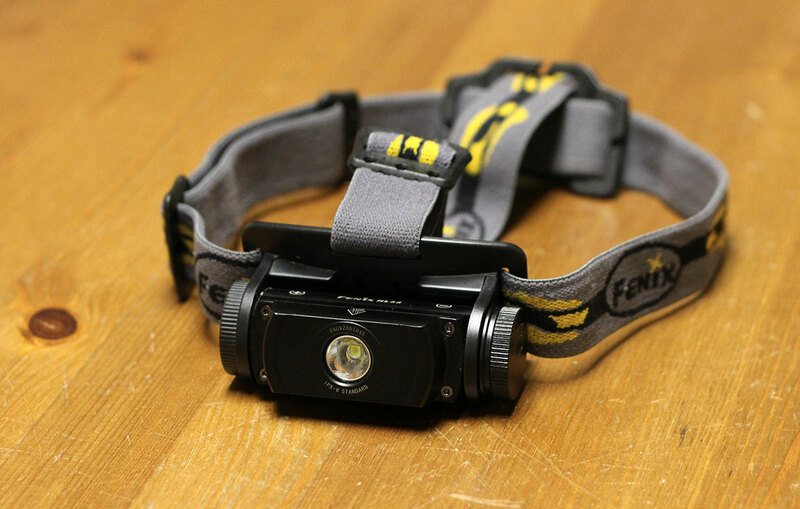 Rugged, waterproof, and bright, the HL55 headlamp by Fenix is a workhorse of a light. Its anodized aluminum body houses a single large LED capable of igniting a dark trail (or burning a retina if carelessly aimed at a face). Indeed, from a small lens the headlamp can blaze up to 900 lumens of night-piercing light in “turbo” burst mode, and maintain a hefty 420 lumens for 3 hours, 45 minutes. Fenix Lighting cites a shine distance of nearly 400 feet. We tested the $77 Fenix HL55 headlamp over the past two months, including hiking, running, and biking at night. 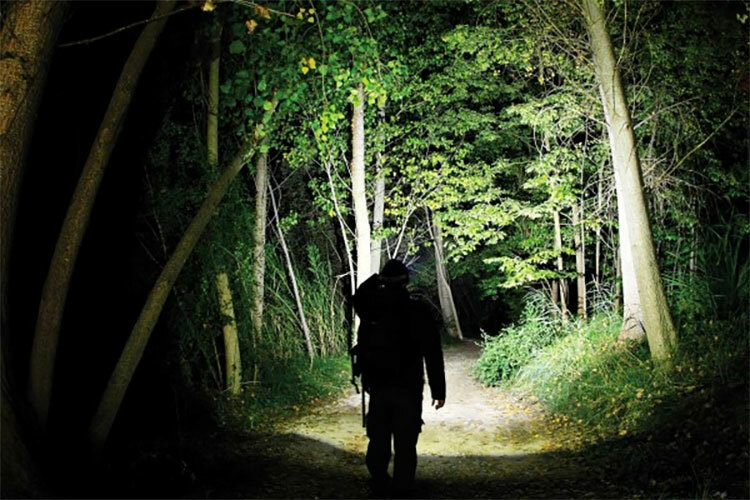 We also reviewed it during night orienteering and adventure racing events, where visibility is needed to read maps, follow dark trails, and find checkpoints hidden in the dark. As headlamps go, the HL55 is small for its brightness. Just a couple years ago a 900-lumen light would have required a large lens, multiple LEDs, and a big external battery pack on a cord. The Fenix, in contrast, houses all its power and light technology in a slim, 3 x 2-inch metal box. An elasticized band keeps it centered on the forehead even if you’re running hard and bouncing down a trail. Its light is more a bubble than a beam. Click through the settings, from “eco” low to its highest brightness, and the night ahead is confronted with an increasingly larger orb of pure white light. I like the “bubble” effect for hiking and general use. There is no beam adjustment, however, meaning you cannot spotlight the unit for a sharp beam if reaching to see detail at a pinpoint ahead. At about 6 ounces with a battery, the HL55 is heavier than other headlamps of its size. The weight was noticeable at first, but Fenix’s over-the-top band spreads the load over the head and keeps the unit in place. 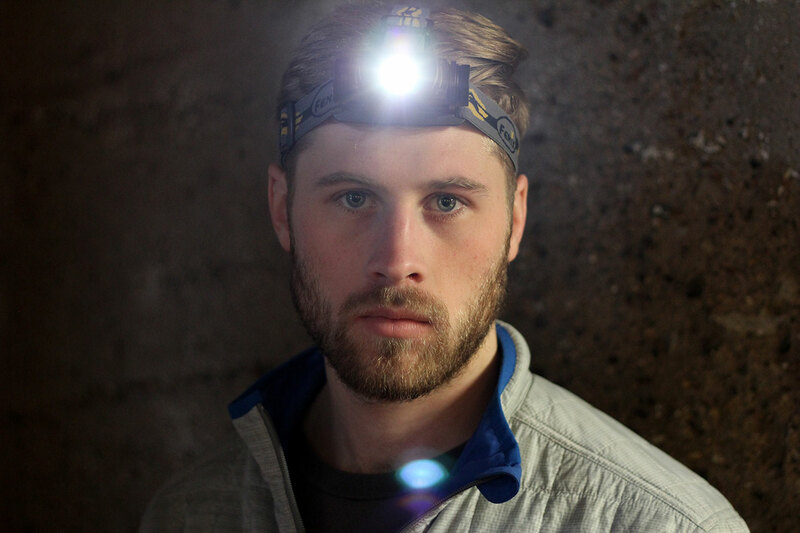 The headlamp uses rechargeable 18650 or CR123A batteries (not included). Run times between charge-ups range from 150 hours on the lowest setting to a bit under 4 hours at its max brightness. For an extreme test, we put the HL55 in the pack of a Team GearJunkie athlete competing in the United States Adventure Racing National Championships. The 24-hour event pushed racers to navigate at night in the woods and on mountain bikes. “I have only good things to say about this light,” said racer Andrei Karpov. He has tested several headlamps over the years and praised the HL55 for its brightness and small size. Karpov alternated between medium and high beam settings during the Adventure Racing National Championships. He carried one spare battery, and about five hours into the night switched as the first 18650 battery ran low. “The headlamp gave a clear view of the terrain when I needed to navigate at night,” he said. Overall, our staff and athletes were impressed with the Fenix HL55 light. We have been testing products from the company since 2010 and are happy to see the evolution of its headlamp line to brighter and more rugged builds. The metal case sets this unit apart. Most cases in the category are plastic. It’s waterproof, too, garnering a IPX-6 rating for use in rain or submersion. Look to this light as an all-around performer. Its max brightness is overkill as a basic campsite light source, but at $77 retail (and available for less on sale), the Fenix is a good value and a solid choice for anyone needing to move fast through the night.